Putin Offers Political Asylum To James Comey, Citing Potential Prosecution In U.S. : The Two-Way "What's the difference between the FBI director and Mr. Snowden?" Russian President Vladimir Putin asked Thursday, responding to a question in his annual Direct Line call-in show. Putin Offers Political Asylum To James Comey, Citing Potential Prosecution In U.S.
"What's the difference between the FBI director and Mr. Snowden?" Russian President Vladimir Putin asked Thursday during his yearly live call-in show, saying that he would offer political asylum to fired FBI head James Comey in the same way Russia has sheltered former NSA contractor Edward Snowden. By phrasing a question uniquely constructed for these unusual times, Putin put a new spin on the ongoing saga over Russia's tampering in the U.S. election, links between President Trump's inner circle and Russia, and allegations that the president tried to stop at least one line of inquiry. Comey recently testified that Trump fired him after asking him to end the investigation into former national security adviser Michael Flynn — a request that Comey says he memorialized in personal notes that he allowed to be leaked to the media. "[Comey] said he'd written down his conversation with President [Trump] and handed it to the media through a friend of his," Putin said, according to a translation by Radio Free Europe. "This does sound and look odd: the director of a security service making records of his talks with the supreme commander and handing it over to the media through a friend of his." Putin made the remark during his annual Direct Line appearance on state TV, in which he spends hours taking questions from a studio audience and from civilians across Russia. 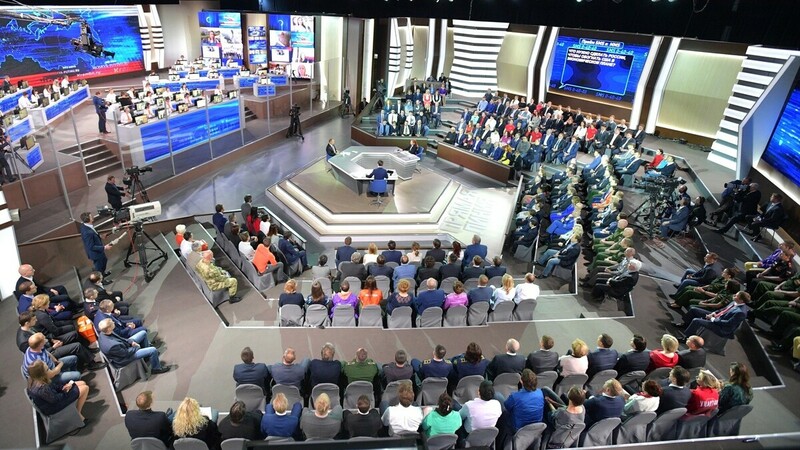 Russian President Vladimir Putin answers questions from a studio audience and citizens calling in, at his annual Direct Line session on Thursday. Comparing Comey to Snowden, Putin said, "It makes him not a security service director, but a civil activist advocating a certain belief." He added, "By the way, if he faces any kind of prosecution in this regard, we will provide political asylum in Russia for him as well. He should be aware of that." As wide smiles broke out among the studio audience at that last remark, Putin pivoted in his chair, signaling that the question had been dealt with. 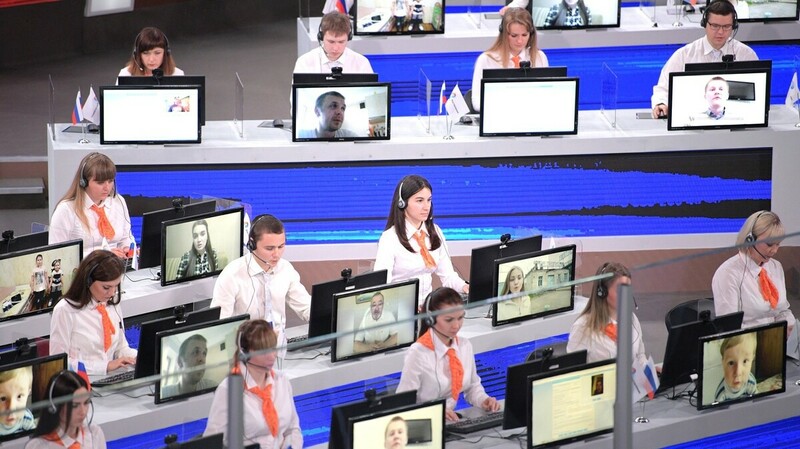 This year, the Kremlin says, the call center that funnels the public's curiosity received some 2 million messages, including 1.3 million phone calls. The Kremlin says most of the calls at this year's question-and-answer session dealt with Russia's future. Many of the topics centered on wages, inflation and the economy. Operators take live calls from across Russia. The call center received some 2 million messages, including 1.3 million phone calls. Noting that the U.S. Senate has moved to impose new sanctions on Russia and to prevent the Trump administration from rolling back the sanctions without congressional approval, Putin said, "Whatever the case, I believe this is utterly groundless." Putin's annual Q&A sessions are notorious for generating softball questions for the president. Late in Thursday's session, for instance, one man asked, "What is the largest fish you have ever caught?" Putin replied, "20 kilograms (44 pounds)," while also acknowledging that if someone added a bit of weight to the scale when he wasn't looking, he hadn't noticed.